Jumping from the GTX 1080 to the RTX 2080 will cost users an extra $250 USD. Eurocom is proving that the MXM form factor is here to stay even in the face of Dell's proprietary DGFF solution for the Alienware Area-51m. The first batch of gaming laptops equipped with GeForce RTX graphics are already out in the wild from major OEMs like MSI, Asus, Gigabyte, Dell, and others. In nearly all of these cases, however, the GPUs are soldered and not user removable. Fortunately, Clevo and resellers like Eurocom are now offering configurations with removable RTX graphics cards that can be swapped and upgraded without voiding any warranties not unlike a traditional desktop. Eurocom has updated its existing lineup of enthusiast laptops like the Sky X4C to include RTX 2070 and RTX 2080 options up from the GTX 1070 and GTX 1080. Existing owners of a Sky model can likely request only the MXM 3.1 RTX 2070 or 2080 module from Eurocom instead of purchasing the entire laptop all over again — an important advantage of user-removable graphics. As for the RTX Max-Q series, Eurocom has no new announcements for the time being. Its last Max-Q offering was the Eurocom Q5 with GTX 1070 Max-Q graphics. See our full performance overview on the mobile RTX Turing series here for more technical information and benchmark comparisons. 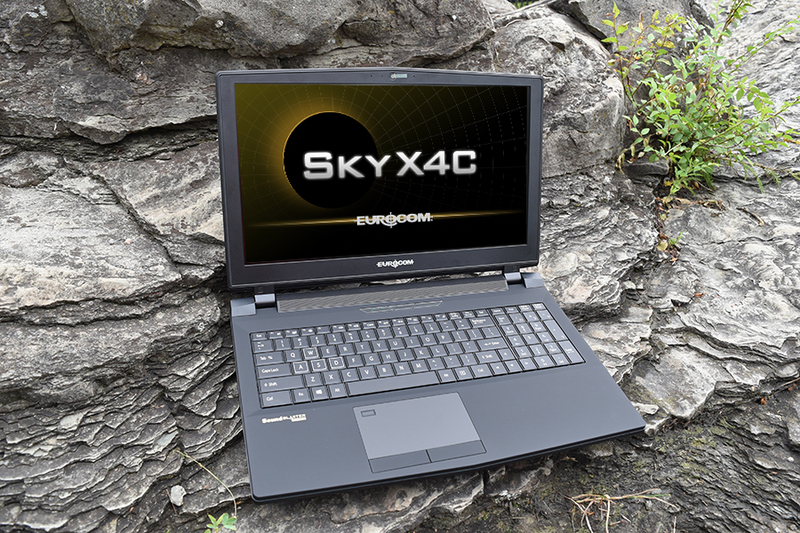 The Eurocom Sky X4C with RTX 2070 graphics is currently shipping for a starting price of $2100 USD. Raw. Power. Are you ready for RTX 2080 Eurocom’s new GPU upgradeable Mobile Supercomputers? Raw. Power. That is what Eurocom’s new Mobile Supercomputers will offer at the end of this week. 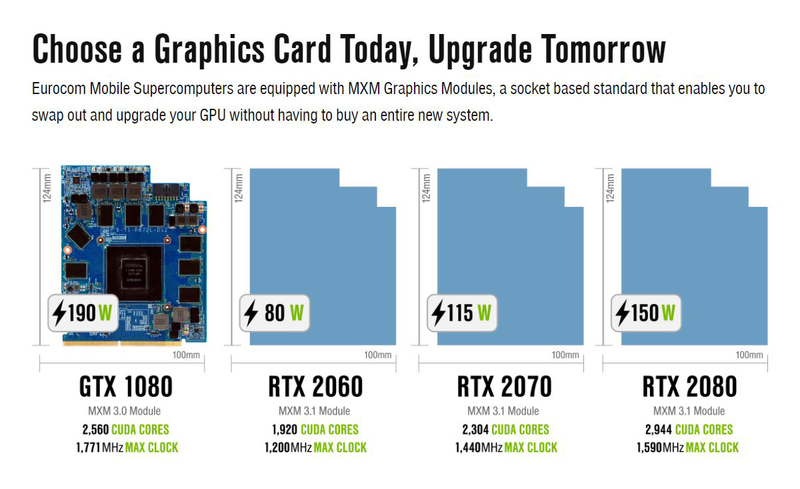 This Tuesday, January 29th, 2019, NVIDIA’s revolutionary RTX graphics cards platforms go live. These RTX 20 series graphics cards are the most powerful consumer GPUs ever released. Nvidia’s RTX 2080, the flagship of the RTX platform of GPUs, is the most powerful GPU that today’s professionals and gamers alike will be able to mount in their towers. With a mind-blowing 2944 CUDA cores and 8GB in GDDR6 memory, the RTX 2080 will deliver a blistering boosted speed of 1590 MHz! But, what’s really mind-blowing is the fact that Eurocom, manufacturer of the world’s most powerful laptops, are putting nVidia’s RTX 2080 GPU in a laptop form factor. At first glance, you are probably thinking of the gaming applications of this revolutionary equipment. And, you’d be right! Casual and professional gamers alike are always eager to acquire the most recent, net-gen technology that will propel them to or keep them in stardom! But the potential of Eurocom’s line of Mobile Supercomputers, starting with the Sky4C, goes far beyond that. Gaming-level equipment is often used as a industry-standard measure of quality, and Eurocom will offer customers the option of choosing the king of the hill, the RTX 2080, or the 2070 and 2060. But, gaming is just the beginning. As usual, Eurocom isn’t just putting the best equipment in the best form factor, they are pushing the envelope to new levels. Most gamers and professionals know about running multiple graphics cards in one system. Eurocom is the only company in the world that produces laptops that offer this ability, but the company isn’t stopping there. Eurocom Supercomputers offer far more than an elite gaming platform for professionals to work hard and play hard on. They are offering a whole new way to work and play. With Eurocom’s series of Mobile Supercomputers comes a new ability: the ability to run dual GPUs. Note, this is not the same as offering multiple GPUs in SLI. The distinction may not be immediately clear to gamers, but to professionals running complicated, demanding software, the difference is glaring and impactful. Most professionals in the market for a mobile supercomputer want something that can enable them to work hard and play hard. A Eurocom Supercomputer offers to empower these individuals to accomplish demanding tasks at speeds never before possible. Running two GPUs is like putting a supercharger on a snowblower and clearing a driveway quicker than normal. Running dual GPUs, particularly the 2080, 2070, or 2060, is like putting a second snowblower on the laneway and clearing it in half the time! We felt the metaphor was appropriate, given the weather in Canada, but more practically speaking, industrial implications are staggering. Industries such as AI development, 3D scanning & rendering, VR software development, and financial modelling are all extremely demanding, extremely lucrative industries. Each one of them is answerable to one thing: the clock. Time is the enemy of all of these industries; each of them profits immensely from reaching the finish line first. Eurocom Mobile Supercomputers, armed with RTX GPUs, harnessing the limitless potential of Dual GPUs, are the perfect weapon in these races against time. Eurocom’s Mobile Supercomputers will harness the newfound power of nVidia’s RTX GPUs and put them to work in a dual GPU format. This will empower professionals to profit from their technological investments and industries like never before by allowing to work at speeds they have never worked at before! We live in an age where speed and power separate industry leaders from followers; beating the deadline from meeting the deadline. Regardless of your personal or professional needs, Eurocom’s Mobile Supercomputers, armed with nVidia’s RTX GPUs will empower you to take your performance to level never seen before.